In my review of TEACs Reference AG-H300mkIII AM/FM stereo receiver, I noted that it was a remarkably functional component that actually sounded pretty good, all for a price of $349 USD. Not only did it allow me to connect my CD and DVD players, it also featured a moving-magnet phono stage for my turntable. The AG-H300mkIII struck me as the ideal stereo receiver for assembling an inexpensive second system for an office or bedroom. It also seemed the perfect "gateway" component for an audio newcomer on a budget looking to build his or her first system. 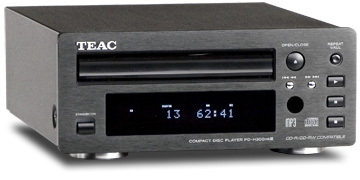 This month I review TEACs matching CD player, the Reference PD-H300mkIII. At just $229, the PD-H300mklII is on the first rung of the high-end ladder -- I cant think of another dedicated CD player at a lower price. Sure, scores of DVD-player models can be purchased for under $100 that will play your CDs, but I dont recommend going that route. Their inferior CD sound aside, I dont like the extra time it sometimes takes DVD players to read and start playing a CD. When I built my first stereo system, I bought a DVD player, thinking that Id appreciate the added advantage of being able to play MP3s. I ended up regretting this decision, and ultimately ended up buying a dedicated CD player. Unless you need it for playing movies, I advise you to use a dedicated CD player for music. In the long run, it may even save you money. The PD-H300mkIII is the perfect visual complement to the AG-H300mkIII receiver. It shares the same black casework and brushed-aluminum faceplate, and its footprint of 8 7/16"W x 3 11/16"H x 12"D is nearly identical. I could easily read its good-sized display from the comfort of my listening chair, from which the remote control allowed me to select songs, program the track order, and perform the usual suite of functions I expect of a remote. The PD-H300mkIII uses a 1-bit D/A converter (TEAC doesnt specify who makes it) with an 8x-oversampling digital filter. It will play your CDs, CD-R/RW, and MP3/WMA discs. The ability to play MP3s was a pleasant surprise, and I think says something about TEACs target market for this product. Most people I know listen almost exclusively to compressed music files and arent about to forgo the convenience of storing +100 songs on a single disc rather than carrying around a bunch of CDs. I think TEAC was wise to design a product that accommodates the needs of a growing number of todays listeners. Which makes the PD-H300mkIII, like the AG-H300mkIII, a good gateway to the high end -- a feature such as MP3 playback could be enough to sway budding audiophiles to buy it. As their interest in the hobby develops, the ability to play MP3s may become of less importance, and the next CD player they buy might not offer the feature. The TEAC provides a sensible starting point and a firm foundation on which one can build a lifelong interest in the hobby. On the rear panel is a pair of RCA analog outputs and a single TosLink optical digital output. I was pleased to see the latter, which let me send the players digital bitstream directly to the DAC of my Bryston B100 SST integrated amplifier/DAC for decoding and amplification. There are also remote-control RS-232 jacks for connecting the PD-H300mkIII with other TEAC components so that the system can be controlled with a single remote. Again, TEAC has made operation as simple and convenient as possible. The Reference PD-H300mkIII fed my Bryston B100 SST via Kimber Kable Tonik interconnects, the integrated amp in turn driving PSB Platinum M2 bookshelf speakers via AudioQuest Type 4 cables terminated in banana plugs. My reference CD player is the NAD C542. I listened to a wide variety of music through the Reference PD-H300mkIII, and was very impressed with its sound overall. In fact, taking its low price into account, I was astounded by what this little budget wonder could do. The PD-H300mkIII might be the most laid-back-sounding CD player Ive ever heard, yet it rarely failed to engage me. Until I began listening to vinyl, Id always associated an "engaging" sound with those components that tended to offer a more upfront, "forward" sound. My turntable has changed that perception: It sounds more laid-back than anything Ive listened to, yet has no trouble commanding my attention for hours at a time. I dont mean to imply that the PD-H300mkIII sounded like my turntable, but, like the turntable, it tended to set the music either between or behind the plane of the speakers, a more distant perspective than Im accustomed to. As I listened to Alice in Chains Unplugged (CD, Columbia 67703), singer Layne Staleys voice seemed a bit farther back on the stage, as though I was sitting in the second or third row rather than right up front. This is not a criticism -- such an aural perspective did nothing to detract from my enjoyment of the performance. The TEAC displayed great rhythm and speed, and brought the vivacity and energy of what was probably this Seattle bands last great performance into my room. The drum kit sounded punchy and tight, and the cymbals rang with excellent clarity from the back of the stage. I ended up listening to far more of the album than Id planned to. The PD-H300mkIII did a superb job of portraying the depth of this albums soundstage -- far better than I was expecting for $229. Ive heard CD players that cost a lot more that couldnt convey as much depth. Unfortunately, the width of that soundstage was a bit narrow; sound rarely seemed to come from beyond the outer edges of the speaker cabinets. This made the stage of Unplugged sound a bit congested; I didnt hear the spaces between musicians that Im accustomed to with my reference player, the NAD C542. For $229, however, this is a fairly minor complaint. One thing that, in my experience, inexpensive CD players do nearly as well as those costing thousands of dollars is the retrieval of recorded detail. Im not suggesting that a $229 CD player will convey the delicate subtleties or expansive three-dimensional stage of a megabuck model, but it will give you much of what the very best do at a fraction of their prices. Ive found that, in terms of detail recovery, a CD players price has little correlation with its performance. This was the case with the PD-H300mkIII. Its ability to extract plenty of information from my favorite CDs was so good that it took me a while to get over my initial shock. As I listened to Stephen Layton conduct the choral group Polyphony in Morten Lauridsens Madrigali, from Lux Aeterna (SACD/CD, Hyperion SACDA67449), I couldnt believe the clarity with which the TEAC unveiled the unique tone of individual singers voices. I began to think that the PD-H300mkIII wouldnt be out of place in a system with an integrated amplifier costing three or four times its price. There was good depth in the choir, and I got a good sense of the size of Londons Temple Church, where the recording was made. On Glenn Goulds 1981 recording of J.S. Bachs Goldberg Variations, included in the compilation Glenn Gould: A State of Wonder (CD, Sony Classical/Legacy S3K 87703), the pianists incessant humming was readily audible, and gave the impression that he sat a bit farther back than Ive heard with my NAD player. This recordings microdynamics -- minute variations in the volumes of notes -- were clearly perceptible. As Goulds fingers danced across the keys, it was impossible not to get caught up in the excitement of his playing; his enthusiasm was wholly contagious, fully commanding my attention. Was the TEAC able to reproduce the full weight and dynamic range of Goulds Steinway? Not quite, but I cant say Ive ever heard a CD player that could create the illusion of a concert-grand piano in my listening room. As long as a component can hold my attention with such music, Im pleased. The PD-H300mkIII easily managed that task. Another of the TEACs strengths was its midrange clarity. Because I tend to gravitate toward vocal music, this played a significant role in my very positive impression of the PD-H300mkIII. It did a remarkable job of discriminating between the characters of different singers voices, clearly revealing the tonal qualities of each. In fact, other than slightly recessing the positions of singers, I felt that the TEAC pretty much got out of the way, imposing very little character of its own on human voices. On Neil Youngs Live at Massey Hall 1971 (CD, Reprise CDW43327), I was amazed at how transparent and expressive Youngs singing was. Ive heard this from CD players that cost ten times as much as the PD-H300mkIII, but, the subtlest low-level details aside, the TEAC gave me most of their performance at a small fraction of their price. Although I began my listening with the assumption that the PD-H300mkIII should be aimed at newcomers to high-end audio, this disappeared as I began to realize that I might need to revise my idea of what a good entry-level CD player should cost. The PD-H300mkIII made it apparent that that price is considerably lower than Id thought. Although I found a lot to like about the PD-H300mkIII, it wasnt without shortcomings. One of these was the narrow soundstage described above. Another was its bass reproduction, which I found lightweight. I wouldnt describe the PD-H300mkIIIs sound as "lean," but it lacked the fullness, punch, and weight of not just top-notch CD players, but other budget models Ive heard. On "See You Later," from Elliott Smiths New Moon (CD, Kill Rock Stars KRS455), Smith strums his acoustic guitar pretty hard -- its easy to hear the instruments rich, full sound. Through the TEAC, however, Smiths guitar sounded a bit thin, and lacked the breadth and fullness Im used to. I noticed this quality on hip-hop and other music that features prominent bass. While the PD-H300mkIIIs low-end reproduction was OK, that feeling of oomph so important to the visceral re-creation of truly deep bass was definitely lacking. I compared TEACs Reference PD-H300mkIII with my own reference CD player, the NAD C542 ($499). Ive owned a C542 for several years, and often suggest it to people looking to buy an affordable, high-quality player. In terms of features, the NAD and TEAC are pretty similar. The biggest difference is that the TEAC can play MP3 and WMA files; the NAD is strictly a "Red Book" player. This makes the PD-H300mkIII, at less than half the price of the C542, a very good value, and may be enough to influence the decision of some buyers. Though sonically the NAD and TEAC had quite a bit in common, they didnt sound identical. As for detail, the players were on a par: Both let me hear most of whats on my CDs, though the TEAC had the edge in delivering soundstage depth, reproducing deeper, more tangible stages in front of me. With vocal recordings, the TEAC sounded every bit as transparent and pure as the NAD. With their superb midrange clarity, both players offered very lucid views into the performance. In this regard, I think Id have a difficult time telling them apart in a blind listening test. The one area in which the TEAC wasnt able to match the NADs performance was the bass. The C542 created a more solid foundation, its bass conveying not only better impact, but more weight and authority as well. Playing the Elliott Smith disc, the TEAC was a touch cooler than the NAD, which did a better job of communicating the fullness and warmth of the bass guitar in "Going Nowhere." Although the NAD was superior in this regard, its important to remember that this improvement comes at more than a doubling of price, without yielding across-the-board improvements in sound. For someone on a tight budget, the TEAC is undeniably the better value: it provided much of the NADs performance -- and bettered it in its ability to convey depth -- for less than half the cost. After spending a couple of months with the Reference PD-H300mkIII, using it to listen to a wide assortment of music, Im even more impressed than I was with TEACs AG-H300mkIII receiver. The PD-H300mkIII is now the "go-to" product I name when asked to recommend a good, affordable CD player: It gives excellent value and good sound for $229. Its shortcomings have nothing to do with anything it adds to the sound, but are rather sins of omission. Although I think the PD-H300mkIII could easily find itself in an office or bedroom as part of a second system, it wouldnt be outclassed in a stereo rig consisting of components costing three or four times its price. If youre in the market for a CD player, but the recent economic downturn has you trying to stretch your dollar as far as possible, you owe it to yourself to audition TEACs Reference PD-H300mkIII. Buy it, save some money, and sleep well, knowing youve made a very smart purchase. Its a no-brainer.